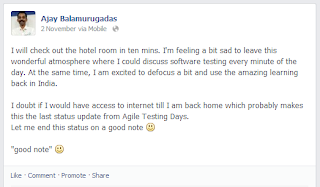 I and my friend Sanket Gagneja were involved in a paired testing session. We had two mobile devices with us. One of the devices had the app which acted as the oracle and the other had the test app. I was keen on using the test app as I was new to this app. Sanket was testing this app since few days. He was the note taker and would answer my questions. I tapped on an icon, typed "test3" and tapped another icon. There appeared a popup with some text. I was reading in my mind and told to Sanket this line "Your development team has really done a good job" and then THE APP CRASHED. We both looked at each other for a second and emailed the logs. I tried to replicate the issue and once the popup appeared, the app did NOT crash. I immediately pressed another button. Sanket took over the device and tried the steps. Then, Sanket did something which made me very happy. He not only repeated the steps but went ahead and told the line "Your development team has really done a good job" and THE APP CRASHED. He was smart enough to not get diverted and actually remembered the exact sentence and repeated it. It is not about remembering the exact sentence. It is more about being aware of what happened, what's happening and is this what is called as "Situational Awareness"? PS: The app seemed to crash after 10 seconds of inactivity once the popup appeared and we took 10 secs on average to say that sentence. 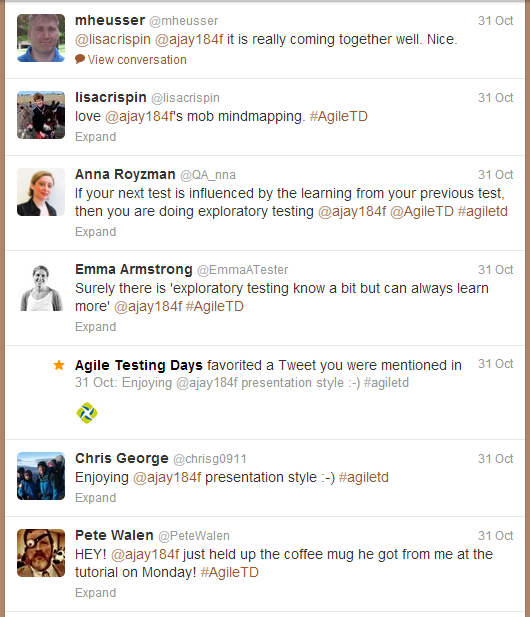 I was very happy to be at Agile Testing Days, 2013. This is how I felt when I was leaving Potsdam, Berlin. And here are the slides explained. The complete slide deck can be found here. 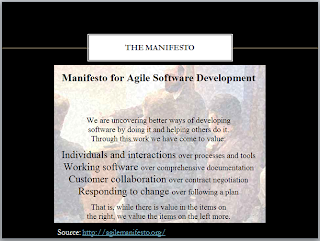 Before I started the session, I showed most of the slides to the audience and a one-liner on what the slide is about. I then gave the option to choose some other session, if the audience did not like what will follow for next 45 minutes. This way, I would have wasted only 2 minutes of someone's time and not 45 minutes. No one left after the quick overview of all the slides. This slide was on even before I started the session. I kept this slide to lighten the atmosphere. Most of the talks I have attended have the first slide with the topic name, presenter's name and maybe the company logo. 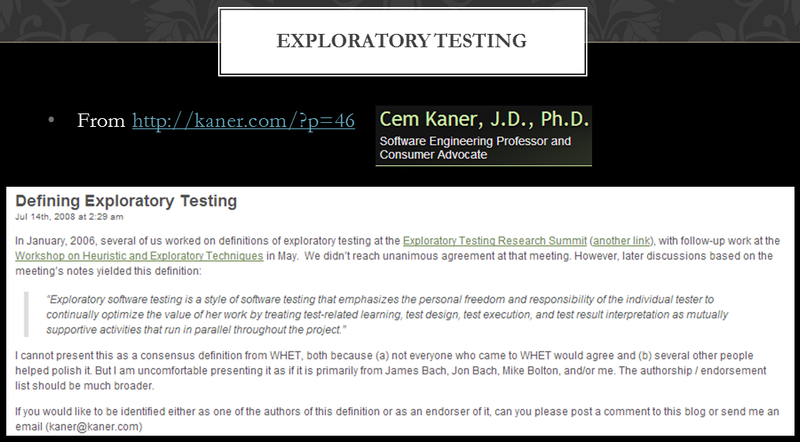 If the next test is influenced by learning from the previous test, you are applying exploratory testing approach. 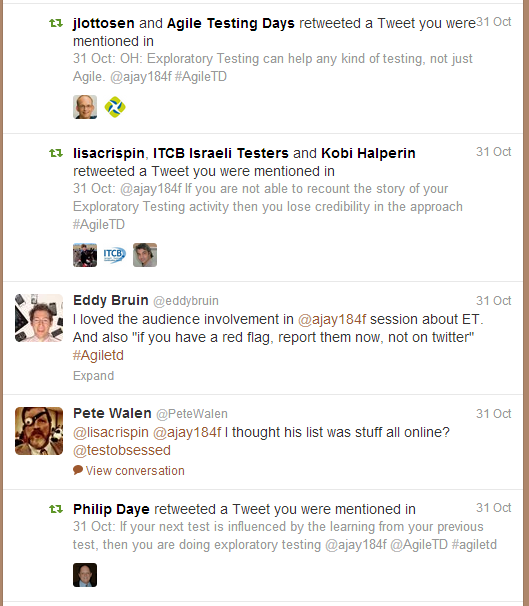 I then- asked the audience on what they feel about Exploratory Testing. 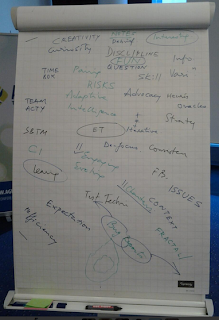 The whole group then came up with a list of words/topics. I played the role of note taker. The beauty of this exercise was each word/topic seemed to lead to a new word/topic. Once we were done with Pros of Exploratory Testing (ET), we also discussed a bit on Cons of ET as per those who complain against ET. 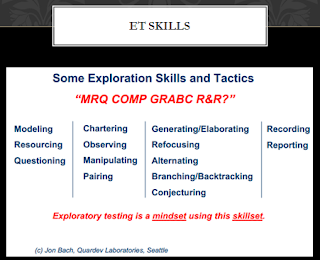 The next slide, we focused on the ET skills, highlighted by Jon Bach. 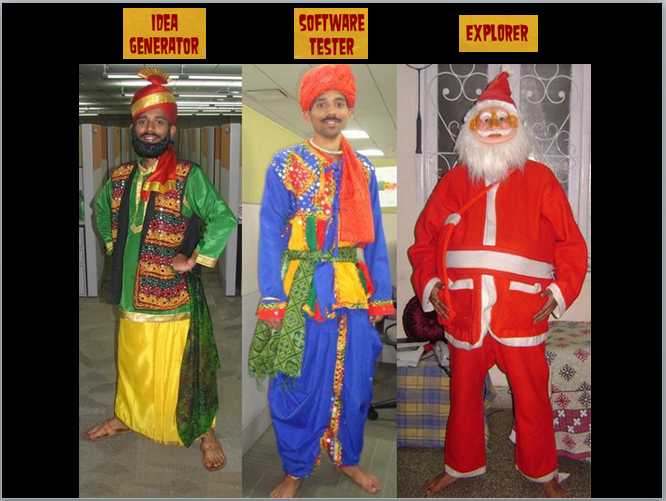 There are some pre-requisites to do exploratory testing which can stand up to scrutiny. 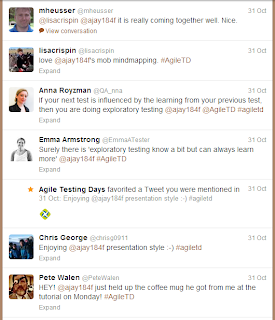 Everyone can test but is your testing valuable? 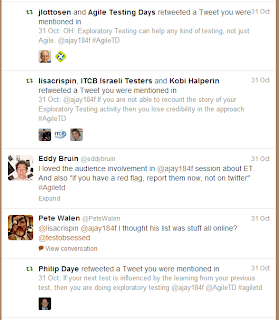 Why do so many people reject ET and force testers to follow a scripted approach? 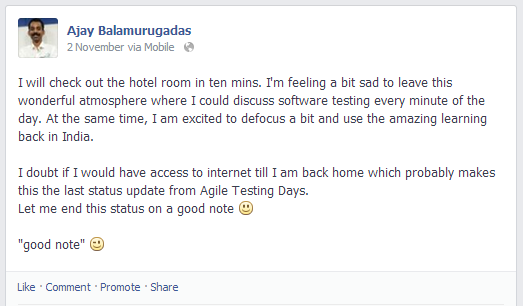 Good testing requires skill and good testers work on their skills. As each link explains the myths in detail, I did not spend more time on this slide. The following slide seems to need more explanation. Let me explain. Work on your skills. 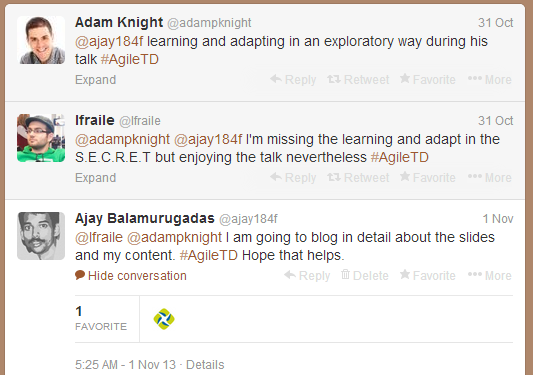 Do not just restrict to testing related skills. Learn from other disciplines. Spend time practicing the skills. Only those who work on the skills will survive. Experience matters a lot. Try to experience as many different contexts as possible. 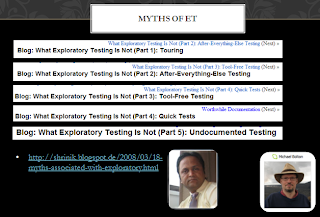 The varied experiences and the experience in a particular context helps you think of different and useful test ideas which would help you in testing. What is the use of any product if it does not solve customers' problems? 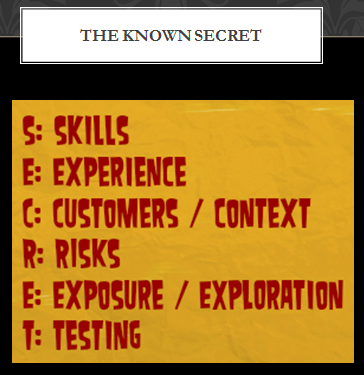 Do you understand your customers and the context well enough to design your test strategy? I do understand that customers is one of the factors in context. My first question to the product owners and the programmers in my company: What is the biggest risk you feel with this feature? What are you worried about the most? The answers help me a lot in understanding the product and the project a bit more in detail. Exploration:This is related to the "Experience" point. In any aspect of the project, pay additional attention to exploration path. Do not restrict it to just testing. Explore in the true sense - to investigate. Finally, I ended my session with a call for questions. 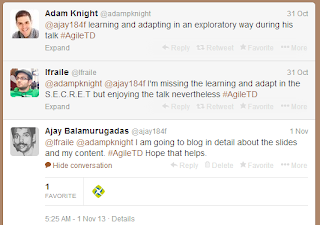 Hope this blog post serves the purpose of the session. 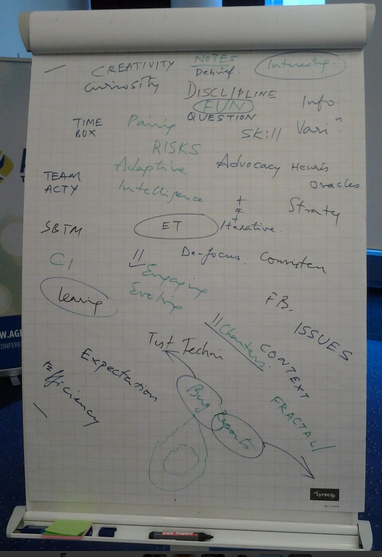 I enjoyed the session where most of us were involved and shared thoughts.